Proust (ish) Questionnaire with a 10 Year-Old | Blog? What blog? My girl turned 10 years old today. It’s a pretty big deal. I decided to mark the occasion by interviewing her to preserve her thoughts on this day. She was a bit distracted, having had a sleepover with 2 besties last night. The interview was conducted while she braided one of her friends’ hair. Yeah. And green onion pancake. What characteristics do you have? Like, if someone were to say, that Nico girl, what’s she like, what would they say? Grace: Joel would say she’s weird. Nico: Yes, he would. I dunno. I guess funny, artsy, I can’t think of a third one. What characteristics do you like in your friends? Goofy, not annoying, and not girly. Snakes. I hate snakes they’re so creepy. How does someone move without legs? What about something like a concept, not a thing? Like…death. Are you afraid of death? If you could go back in time and give a message to your 5 year-old self, what would it be? What are you looking forward to today? This week? This year? Presents. Not camp. Walking home from school on my own. 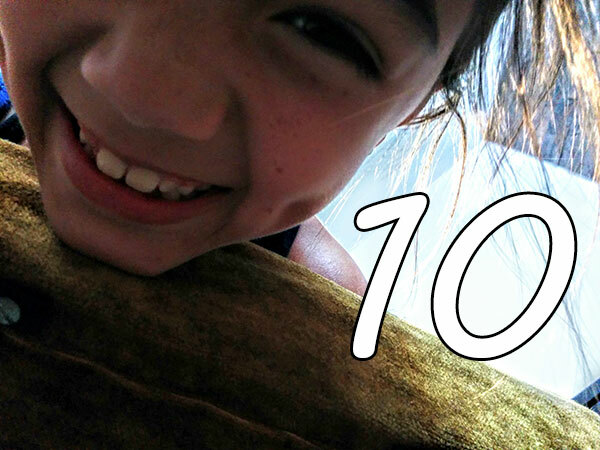 Any final thoughts about turning 10? I get to go to the swimming pool now by myself too. Excellent interview! This makes me want to start reading blogs again.